This last week in Michigan was so. darn. cold. As in, 30 and snowing most days. I couldn't believe it. Here we are in April and it's snowing?! When I looked at the 10 day forecast, I couldn't believe that this coming weekend was going to be 70 degrees! A whole 40 degrees warmer in just 7 days. Hallelujah! Hopefully -- I don't want to jinx things-- but hopefully, that will be the official start of Spring. If not, well...I'll just stare at this inspiration board I made and pretend. This month is about to get crazy-busy, but the arrival of Spring will help ease the stress, I think. I'm not going to hide it, Winter in Michigan is hard. Especially coming from California. Thankfully I lived in Seattle for college for 3 years, so that prepared me for rain and clouds; but nothing could prepare me for the intense cold and all the snow here. I definitely took the sunshine for granted when I lived in California and boy, do I miss it! Through winter's chill and dark, cloudy days, I learned something sweet. As warmer days are on the horizon this week, I found myself thinking of what a beautiful picture snow is for us. God's word tells us that we are washed clean if we turn to him, like a blanket of white snow. Wow! I'm so thankful for the redemption and grace found in that promise, and for the tangible reminder of what Jesus can do to our hearts. I'm also reminded to not be shaken by my circumstances. The cold weather and dreary skies doesn't have to determine the amount of joy I feel. I can remember the promise of SPRING and of the new life it will bring. 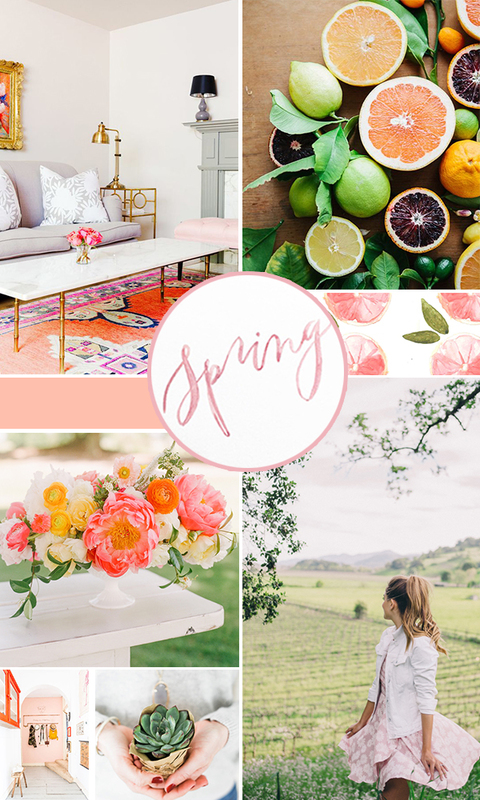 In honor of the warmer temps on the horizon, I created a beautiful citrus-inspired color palette. It's so warm and inviting! Here's to Spring sticking around!